Our last day on the Northumberland coast got off to a gloomy start. Persistent drizzle clung to the windows and rooftops. Worse yet, my husband announced, limping down to breakfast, that he thought his gout might have returned. The medication was something I had neglected to pack, this being just a short break. We had planned to drive further up the coast to Alnmouth, where we last stayed when our son was small. And, selfishly, I could not bear to be this close to Dunstanburgh Castle without at least taking a look. Armed with the golf brolly, he agreed to give it a go! Alnmouth, though charming, did not invite us to linger, despite the determinedly cheery exterior of the Sun Inn. Memories of sitting amongst the dunes, in strong sunlight, warmly wrapped against the breeze, and with a small, ‘happy as a sand’ boy, seemed very far distant. Given the situation, driving was easier than walking. The wide ranging views I’d hoped for were swallowed up in the gloom, but a surprising number of people were parked in the tiny village of Craster. The walk along the coast, from here to Dunstanburgh, is deservedly well known. I had scarcely left the car park when I was captivated by the soft webbing of droplets, clinging to these hardy plants. It was obvious that he could not limp far but, given a slight break in the rain, I was keen to walk this dramatic coast. We agreed that I should sprint ahead, while he took it at his own pace, hanging on to the umbrella for support. There, in the distance, was the prize. The sheep were quite oblivious to its beauty, us walkers far more susceptible to charm. On the shoreline a sequence of cairns had me hovering with camera for a while. A mother and daughter, close by, were gleeful in their discoveries. Almost there now, it’s time for a little history. 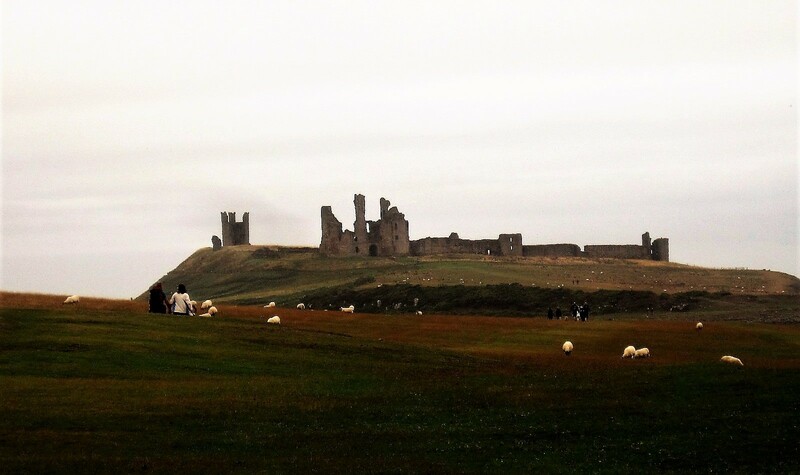 Dunstanburgh Castle was built by Earl Thomas of Lancaster, the most powerful baron at the time of Edward II. Begun in 1313, it was a mighty statement of Lancaster’s intent. 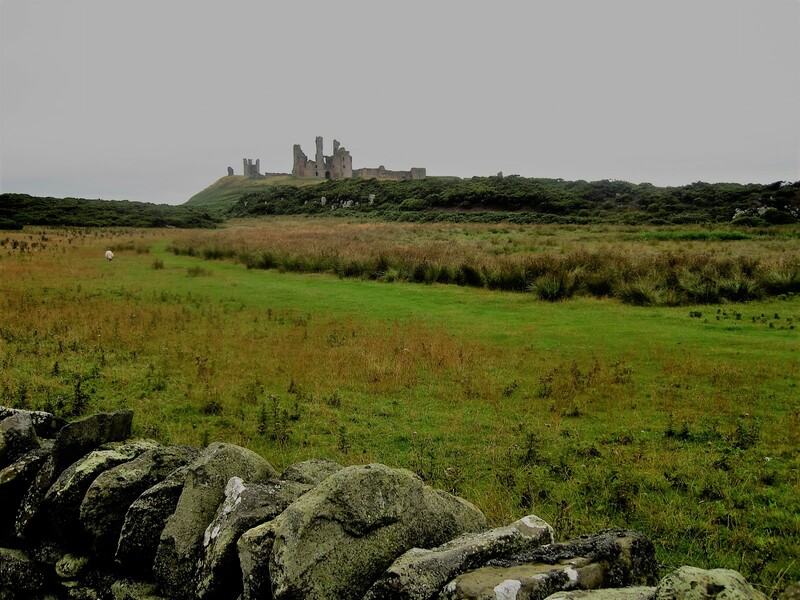 Unfortunately for him, the earl failed to reach the safety of Dunstanburgh when his rebellion was defeated. Kings not being very forgiving in those days, he was executed in 1322. John of Gaunt, 4th son of Edward III, inherited the castle on marriage, in 1362. He subsequently strengthened the castle, converting the twin-towered gatehouse into a keep. Fierce fighting took place during the Wars of the Roses and the castle was twice besieged, falling into Yorkist hands. 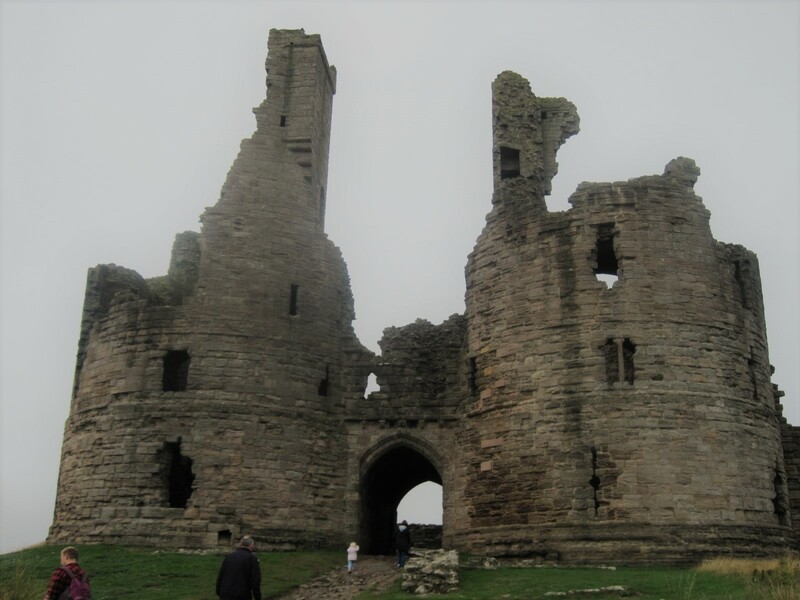 In the late 15th/16th century Dunstanburgh fell into disrepair, too far from the Scottish border and a main road to be of strategic importance. Over time it became a romantic ruin, famously painted by landscape artist Turner. Although I’ve done this walk before, I had never been inside the castle ruins. The sky had brightened for a little while and I simply had to grab the opportunity, while I could. The layout and scale of the site took me completely by surprise. 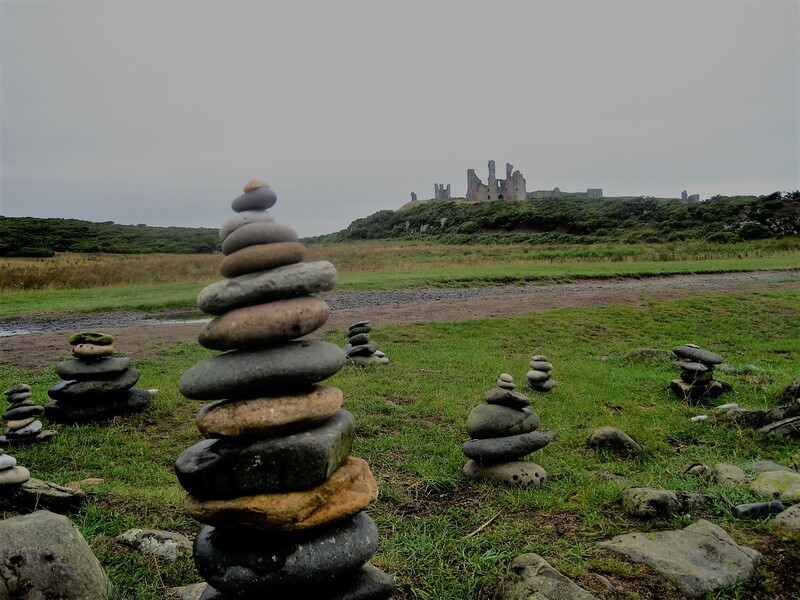 Climbing gently away from the gatehouse, you come to Lilburn Tower, with sweeping views across the fine sands of Embleton Bay. The curtain wall along the coast is still largely intact. Beyond it a steep cliff drops to shore, then tapers down to meet the sea. Again I’m taken with the droplets of rain, this time on wildflowers scrambling along the top of the wall. It turns at right angles, and climbs back up to the keep. I am amused to see a notice suggesting we take care not to step on the frogs. Sure enough, there in a puddle, a lively looking chap! Just time to scoot up the tower, and then I need to get back down and find the other half. It’s starting to mizzle again, and he’s got the brolly. That’s quite enough of ‘weather’, for a while, isn’t it? And probably of castles too. Today English Heritage manages the castle and National Trust are responsible for the coastline. Full details of opening times and how to get there are available on the link. Oh, heck! No cake this week. Many thanks to all of you for trekking out with me, in all weathers. It’s very much appreciated. Time to put the kettle on and settle in to read some more great walks. Join me whenever you can, here on Jo’s Monday walks. You’ll always be welcome. Nicole loves hiking with her Dad. Why not join them? Mel is into her last day or two of walking in Italy. There’ve been highlights! Shazza’s been jangling a few of my memory chords. I’d so love a canal cruise! I’m off to Liverpool on Wednesday, so next week’s walk could well be there. Hoping for sunshine, but anything other than rain will do. A word of warning that next Monday’s walk will be my last for a little while, so if you have a walk you’d like to share please do it this week. I’ll be in the Algarve from the end of the month. Meanwhile, have yourself a great week!